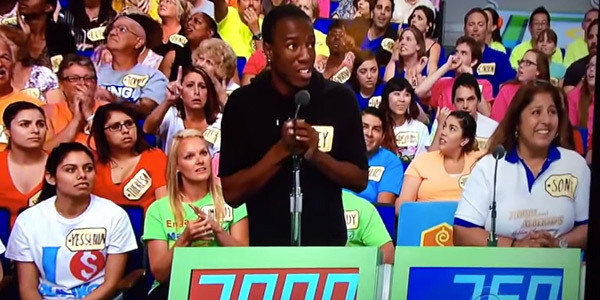 The Price Is Right isn’t exactly a game for intellectuals. All a person needs to know to participate is a general knowledge of the cost of household items and enough savvy to get the most of his or her bid. However, recently a contestant named Corey popped up on the long-running show and quickly proved he was lacking in both skill sets. You can check out what may be the world’s worst Price is Right bid, below. NSFW Warning: The video does contain an F-Bomb. In the video, The Price is Right host Drew Carey introduces us to an extremely nice looking quilted hammock that is supported from the ground up by a large piece of wood. It’s quite a bit nicer than the cheaper hammocks you can hold up between trees or with metal pieces. The first lady guesses $750, followed by a $1,200 and $755. Because contestants want to be as close as possible without going over, there are three competent directions Mr. Corey could have gone in. He could have attempted the always-classic $1 bid. He also could have guessed $755 or $1201 if he really thought the hammock was an expensive one. He doesn’t. Instead, he bids $7,000. That’s right, somewhere in his head a little nagging voice told him that hammock roughly cost the same amount as a nice used car. Carey’s so flabbergasted, he asks the guy to repeat his answer. He then gets in a nice snort before moving forward, but it’s the audience’s reaction to the bid that I am most interested in. The contestant to Corey’s right is rightfully befuddled, and several members of the audience can’t seem to wrap their heads around the $7,000 bid. I personally can’t get over the face of Theresa in the background. It’s classic. For the record: the right answer was $880. For years, contestants on The Price is Right have shown various levels of competence when guessing products. Some go for the high bid when they should go for the low. Some go too low, too early. However, I’ve never seen someone so excited to blatantly overbid. We have no idea how much that hammock actually cost, but one thing’s for certain: it wasn’t over $7,000. The good news for Corey? He may very well be the worst Price is Right contestant in history, but he’s certainly not the worst game show contestant in history. Check out this epic flub on Wheel of Fortune or Jeopardy’s recent category fail. We bet they’ll bring a smile to your face.